2017 is a year of anniversaries for LEGO: it marks 40 years for Technic, and the 10th year for LEGO’s Modular Buildings. 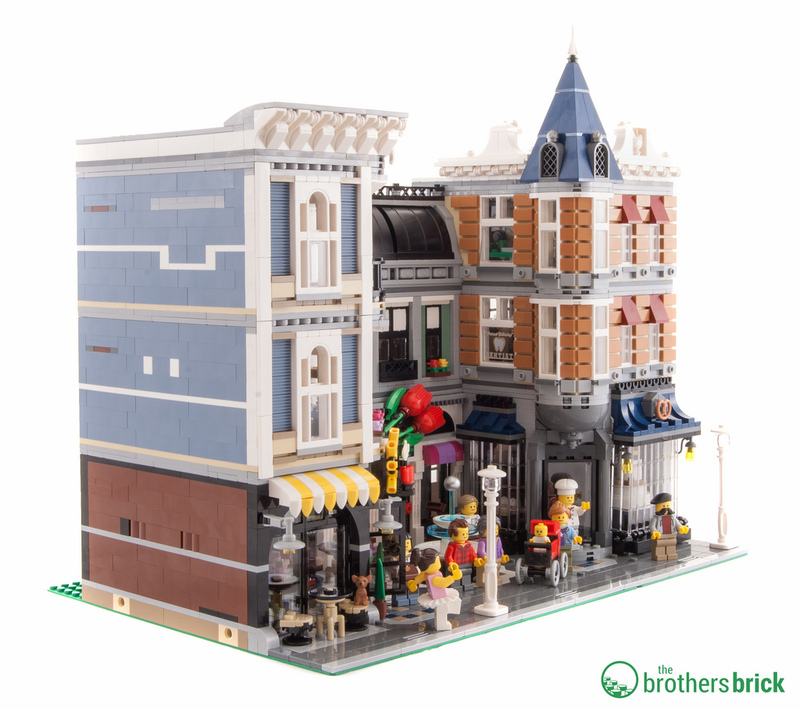 These highly detailed sets clock in at over 2,000 pieces and are most definitely fan favorites. 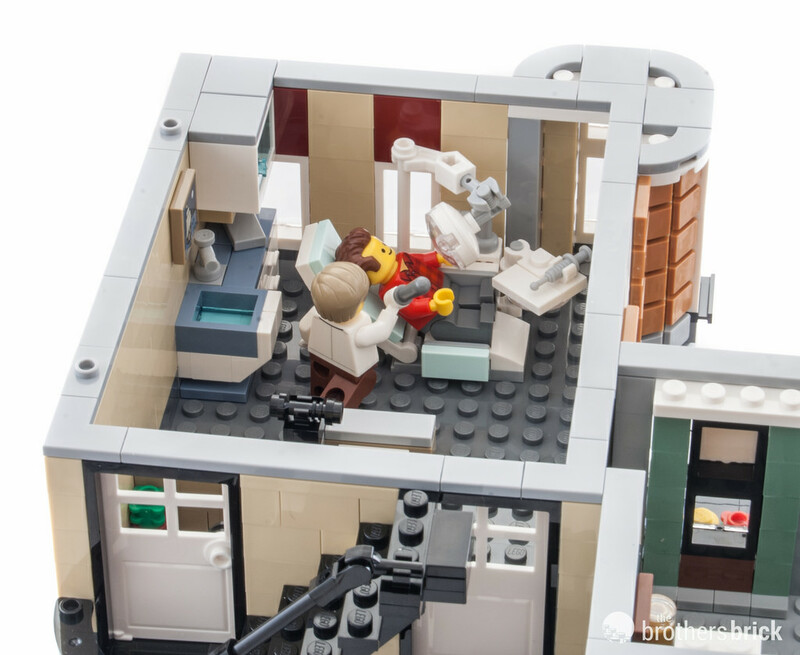 In October, LEGO announced 10255 Assembly Square to celebrate the decennial anniversary of the line. 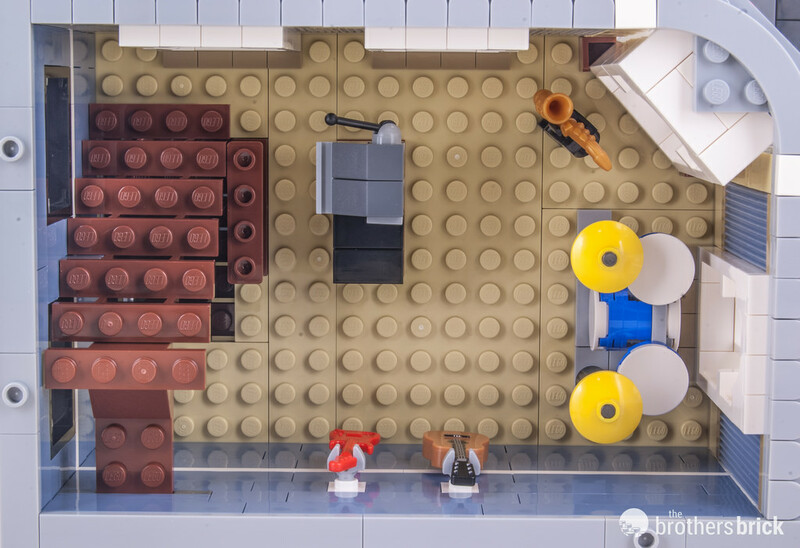 LEGO sent us an early copy, so today we’re pleased to bring you a full hands-on review. 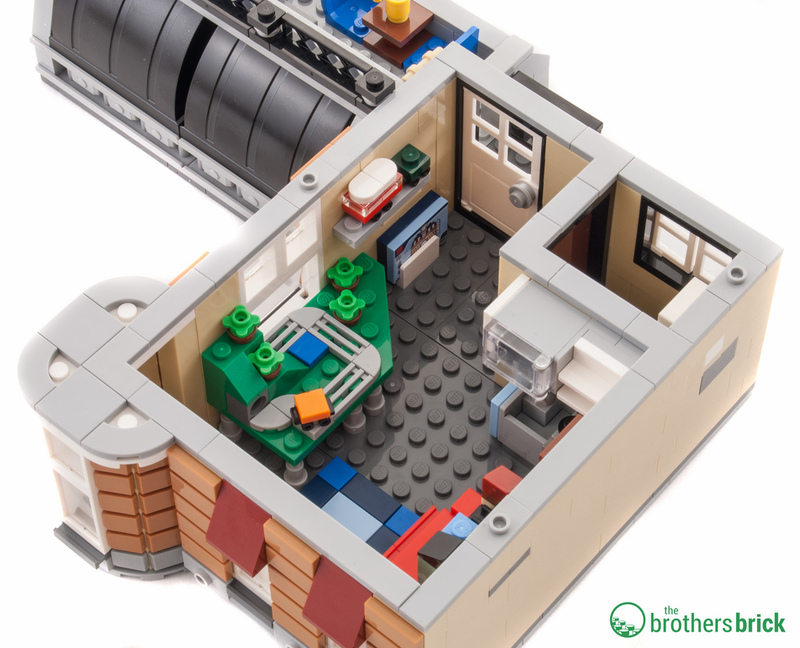 It’s packed full of Easter eggs celebrating 10 years of these fantastic sets, and is the largest modular yet with 4,002 pieces. 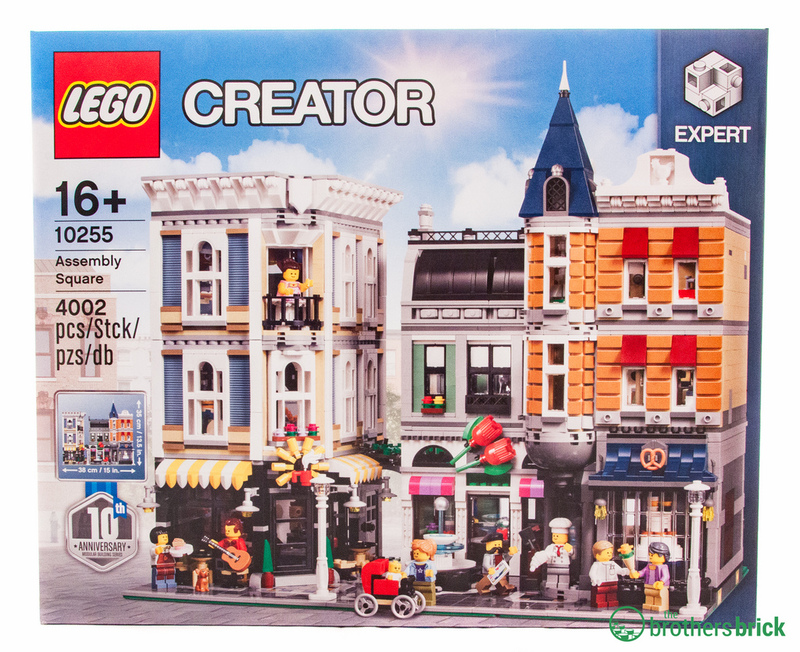 10255 Assembly Square is available now on The LEGO Shop for $279.99 USD. So just how impressive is this set? Read on, because we’re going to tell you all about it. Each of those sets is definitely a highlight of its year. So, how about the newest addition? 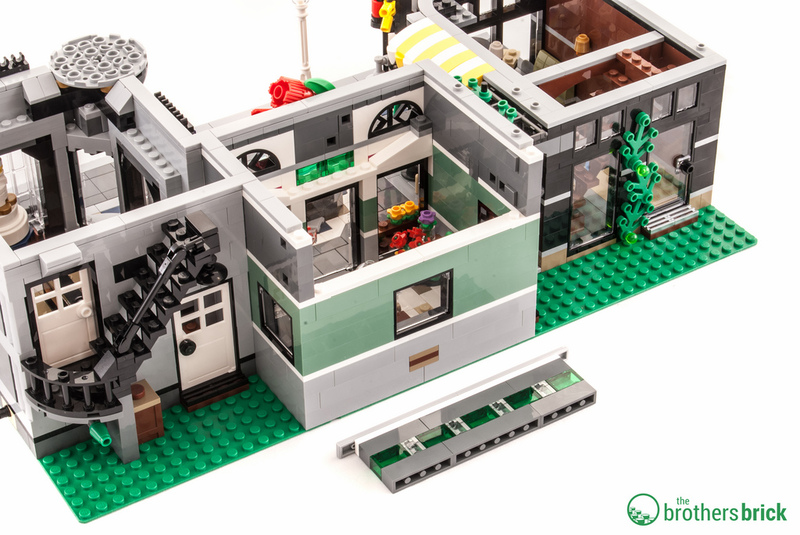 This behemoth is just shy of twice the size of the original modular, Cafe Corner, and priced over $100 more as well. But don’t let that dissuade you; this set is worth every penny — in fact, at around $0.07 per piece, it’s quite a bargain. Here’s the brand new Assembly Square lined up with its original ancestor; they fit together perfectly. Assembly Square comes in a very substantial box much like other large sets we’ve reviewed, such as 75827 Ghostbusters Firehouse Headquarters. Inside are the numbered bags, baseplates, instruction manual, and another large box containing even more numbered bags. 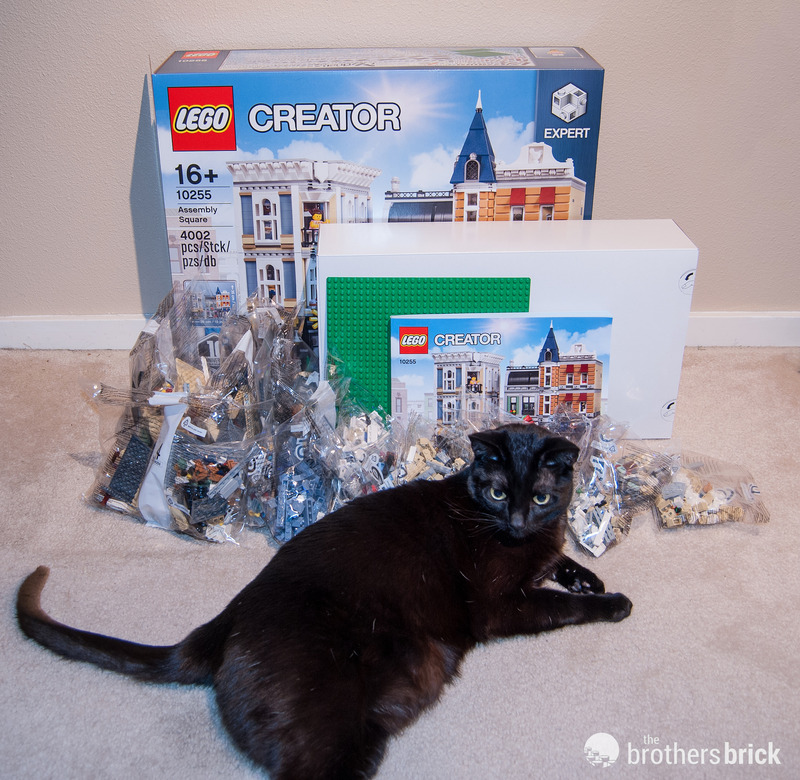 The box and its contents are pictured here with a reference cat for scale. Both the front and back of the box feature a 10th Anniversary logo, and the top displays the full inventory. Thankfully, the box is big enough to show all the parts, because there are a lot. The build takes several hours to fully construct. There are 33 bags covering six segments, and a single 306-page instruction manual. The minifigures are spread throughout the bags. The first notable aspect is the intricately tiled sidewalks and floors. Unlike past modulars, the sidewalks are sprinkled with 1×1 plates, allowing you to pose minifigures without fearing the gentlest bump will send them sprawling. 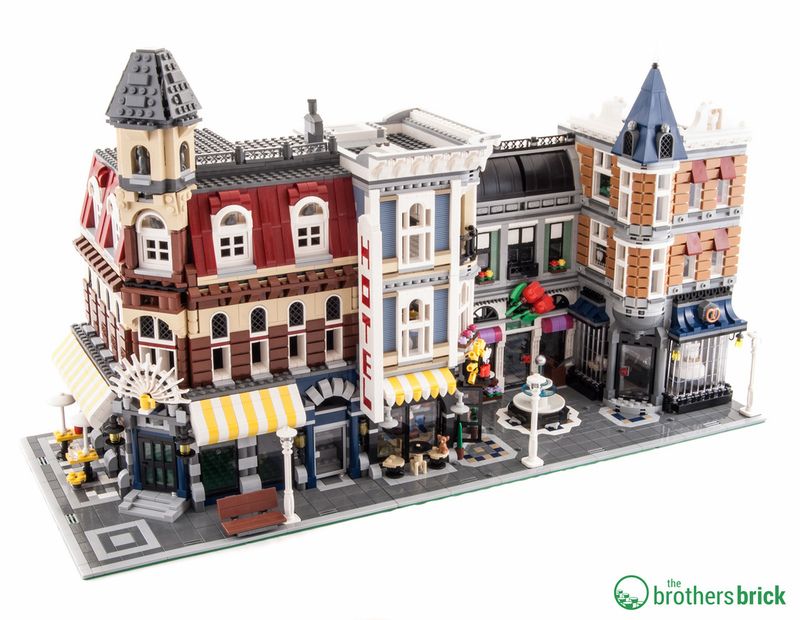 Assembly Square is made of numerous small apartments and businesses, and comes apart into 7 individual pieces when fully expanded. Let’s dive into the sections one by one. The Bakery is full of detail. There are four baked goodies in the oven, and many on display. The back wall features an assortment of very fancy cakes, but the real jewel here is the three-tiered wedding cake in the front window. 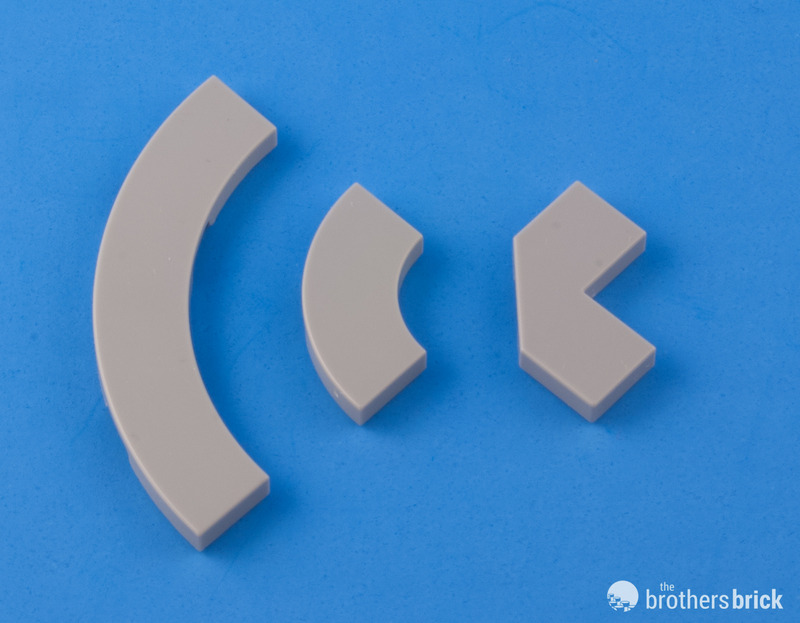 As far as I’m aware, this may be the first time LEGO has used stacked 1×1 round plates to represent minifigures in an official set. 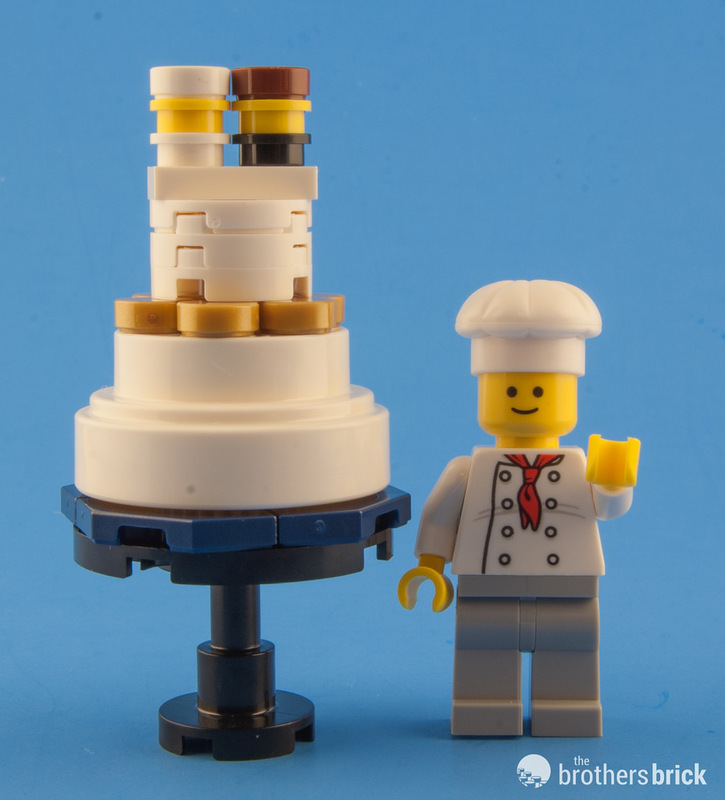 The base is a round wheel hub, which works really well as a fancy tiered wedding cake. The oven door is all brick-built, and ends up looking like a properly massive iron door. The entryway uses some clever SNOT techniques, making use of the 1×1 round tile with pin (inkwells) to invert the large semi-sphere over the door. A similar technique was used to invert portions of the facade in 10253 Big Ben. The windows are made using garage door panels, and the lights make use of the welder’s torch to give a fancy look. From the bakery, there is a passage to the Flower Shop. The Flower Shop is pretty small, and the designers took this into account by designing a removable section in the back upper wall. The shop uses a 1x4x1 lattice fence as a bouquet-holder, which is clever and effective. The parrot hangs out here, presumably greeting customers. The Coffee Shop is light and airy, with a few seats for indoor and outdoor seating. The outdoor patio tables are made from Technic discs. Inside, you’ll find a clever little espresso machine. The back of the shop features the steps to get up to the second level for this building. The Coffee Shop is attached to the Flower Shop by a nice plant-covered grate, which also acts as a covering for the doorway to the stairs. 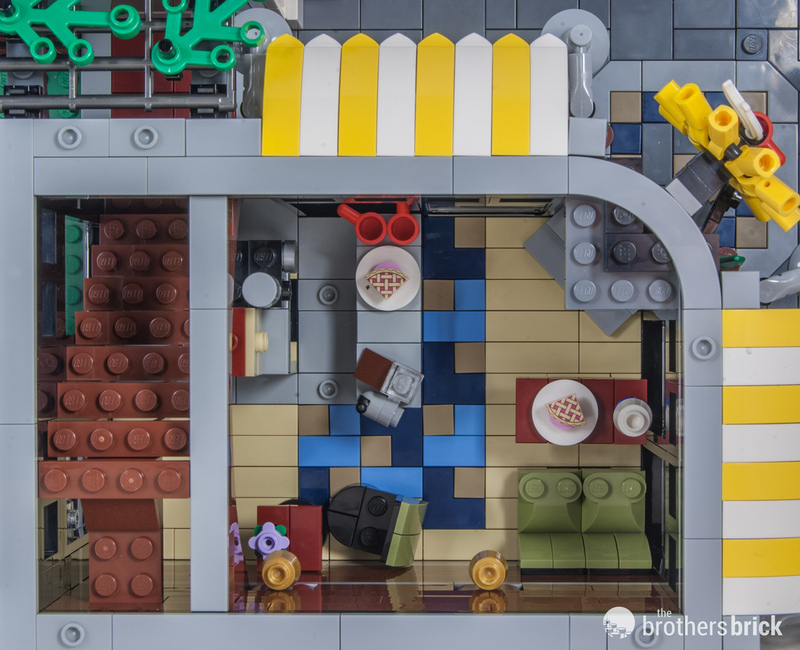 Both the Coffee Shop and the Bakery feature mosaics in the sidewalk using the new 2×2 angled tiles. The center of the square has a fountain, and the base has some nice mosaic work. Sadly, the fountain itself leaves something to be desired, especially since it’s one of the last things to be built in this otherwise highly detailed set. The Dentist’s office is quite nice, although if it’s in the USA, HIPPA violations will abound since the dental exam is out in the open for everyone to listen to how you don’t floss your teeth enough. The front desk is very simple but effective with a phone and a few magazines. As far as the exam area goes, there are a lot of great details here to ogle. The sink is great, making use of a new piece (a 1×2 45 degree slope with tile). There are a few surprises in the drawers, including a billy club. Don’t ask what a dentist needs with one of those. 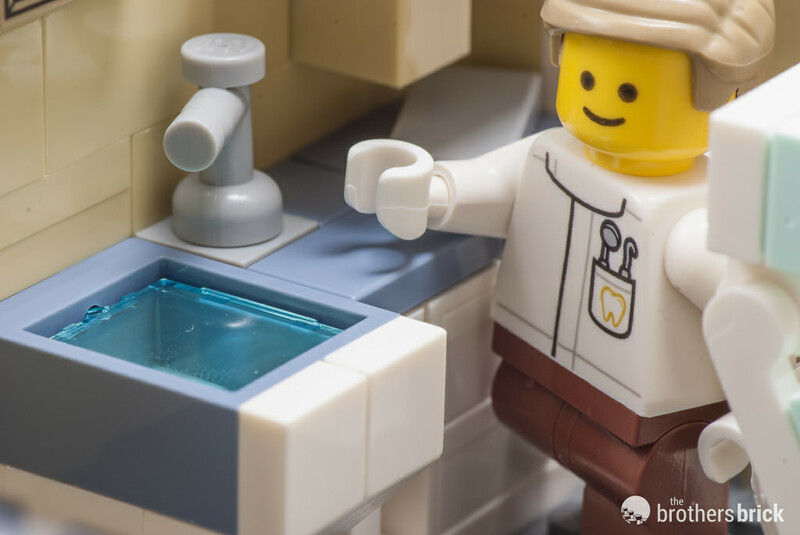 The exam chair is very well done, and the use of light aqua tiles just screams “DENTIST!” The window features a printed glass window insert emblazoned with the words “Prevent Yellowing.” Long-time LEGO fans will get the joke. The cool window feels lost though, since it’s used on the window inside the square, which is hard to see when you’re looking at the build from the front. I understand it wouldn’t fit with the aesthetic of the front-facing walls, but it’s sad it’s been tucked away. The star in the Photography studio is the old camera. 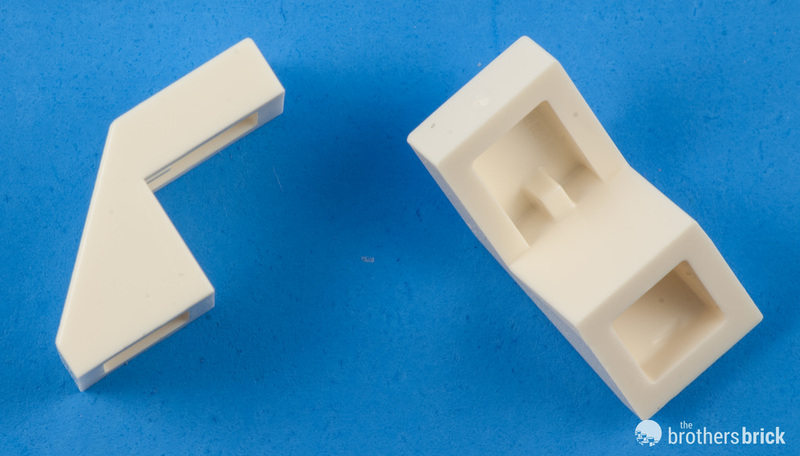 It’s highly recognizable and is only 20 pieces. 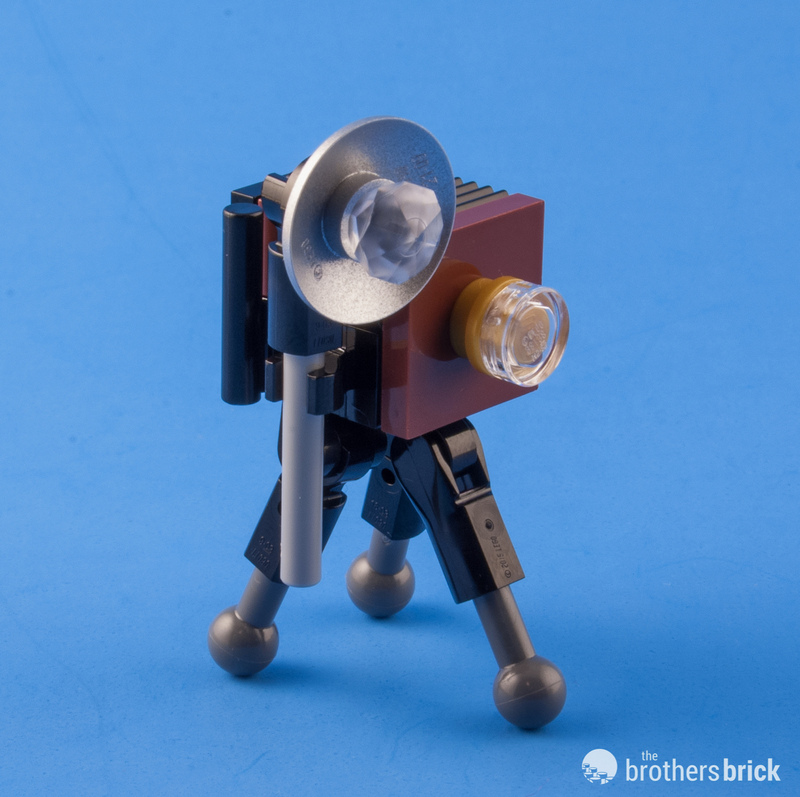 It uses rods with balls as the tripod, which are held between two 1×1 plates with clips. The room is dominated by a brick-built backdrop that employs the curved 1x3x2 bricks to make a nice, even studio backdrop. It’s even got the master roll of paper hanging at the top. 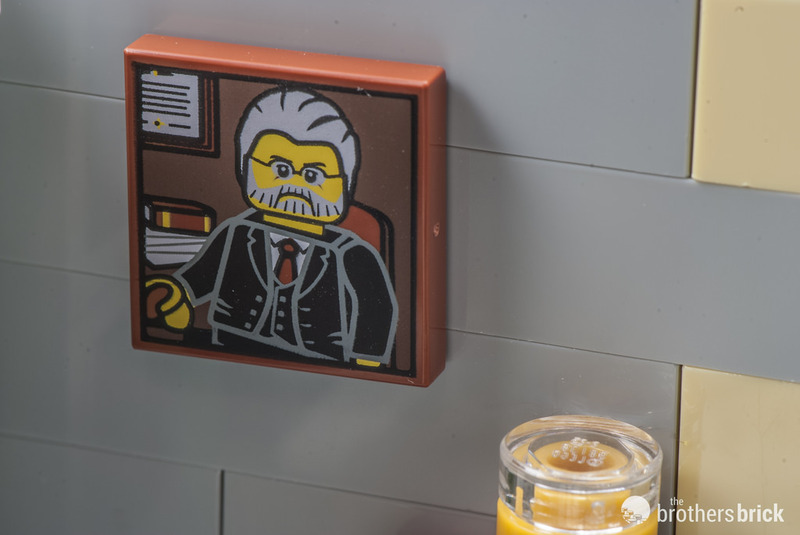 There’s also a nifty little portrait of some old fellow in a business suit as an example of the photographer’s work; it will make the perfect decoration in an executive’s office. The Music Shop is fun. There is a bright red electric guitar and a classic acoustic guitar, along with a saxophone on display and a drum set. The drum set is well done even though it uses few parts. The register makes use of two of the new 1×2 45 degree angle with tiles in grey. The Dance Studio is very simple, perhaps more so then any other part of this build. This floor has just one thing in the room: a piano. However, it’s a wonderfully designed upright piano, making use of a tan 1×2 3 tooth piece for pedals. The other item of note here is the practice bar. 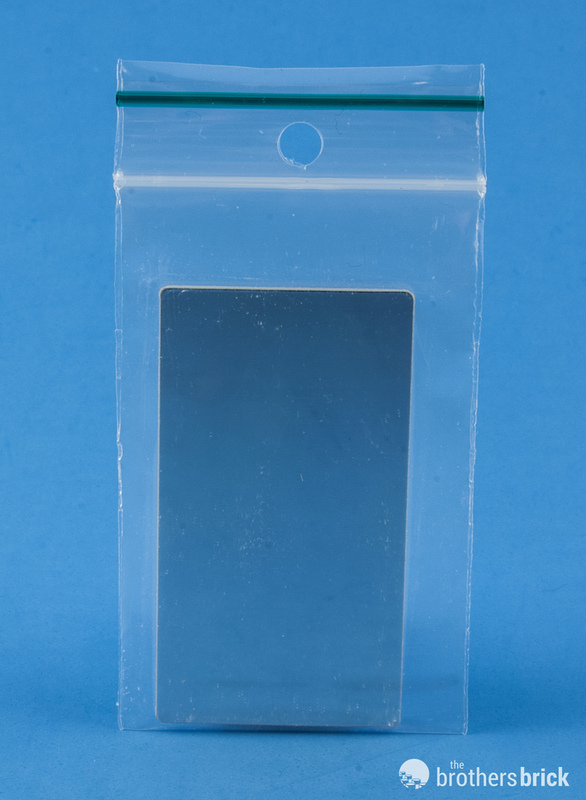 There’s a mirror, made of a clear 1x4x6 door frame insert with a beautifully reflective surface applied to one side. This comes packed in its own resealable baggie so it won’t be scratched. It’s held to the wall by the clips holding the bar, two 1×1 clips, and a row of 1×2 plates with door rails. It’s quite secure and looks perfect. The roof is mostly just architectural details. There is an access point and a skylight, and the sides of the roof use half-arches and 1×1 bricks with scrolls. 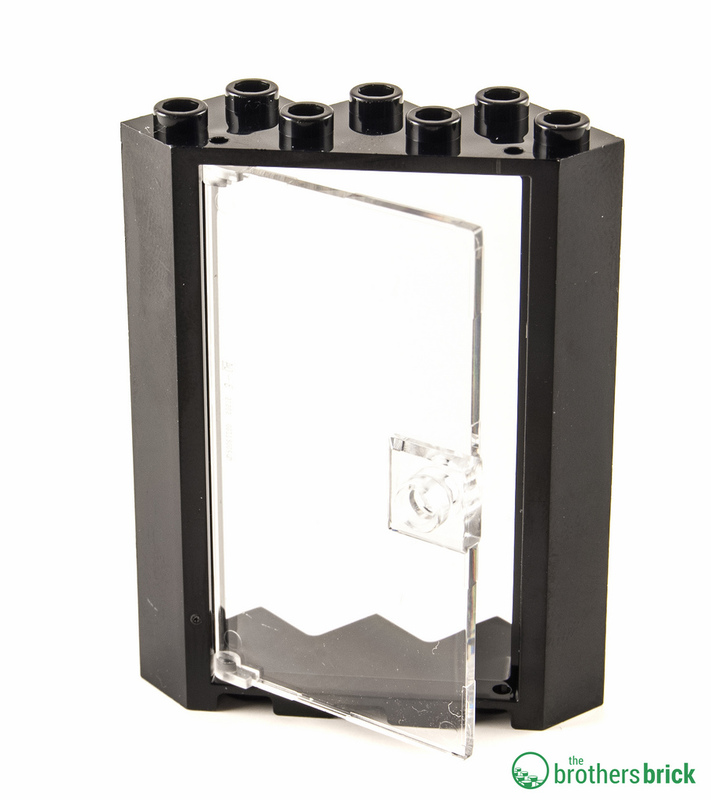 For the corner detail, it uses a white Nexo-Knight shield tile. We saved the best for last: the Loft Apartment. This room is packed with so much detail. 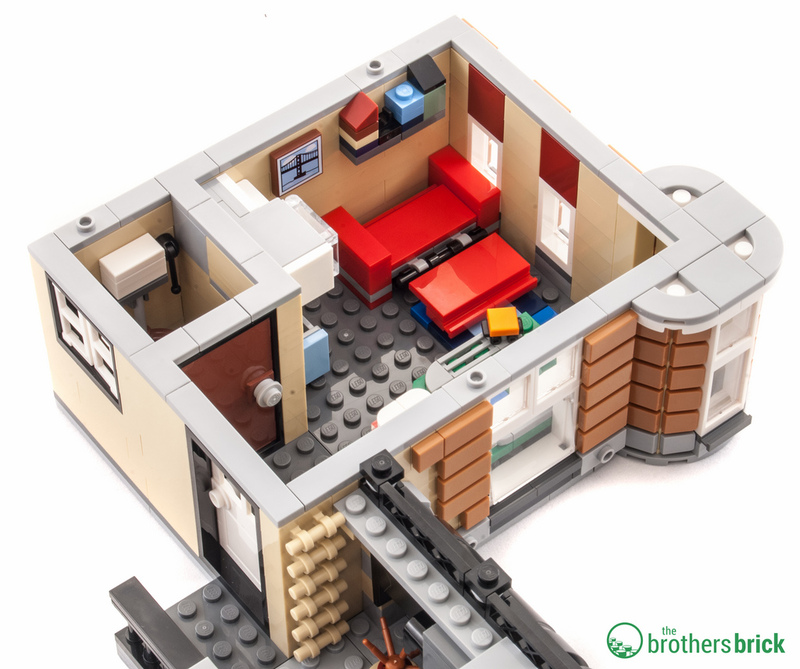 This is where the LEGO Fan lives. 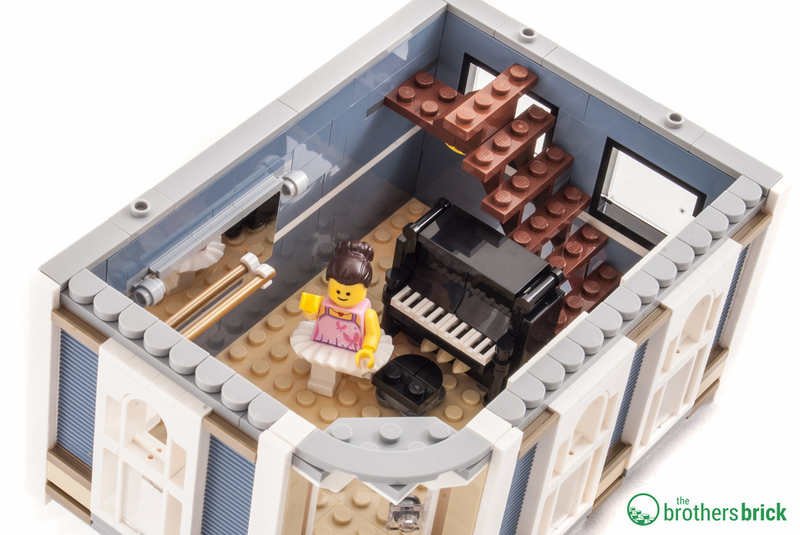 And seriously, props to her to have such a great loft apartment and still afford all the sets she’s got on display — and food (she has a kitchen, so I am assuming she can afford to eat). 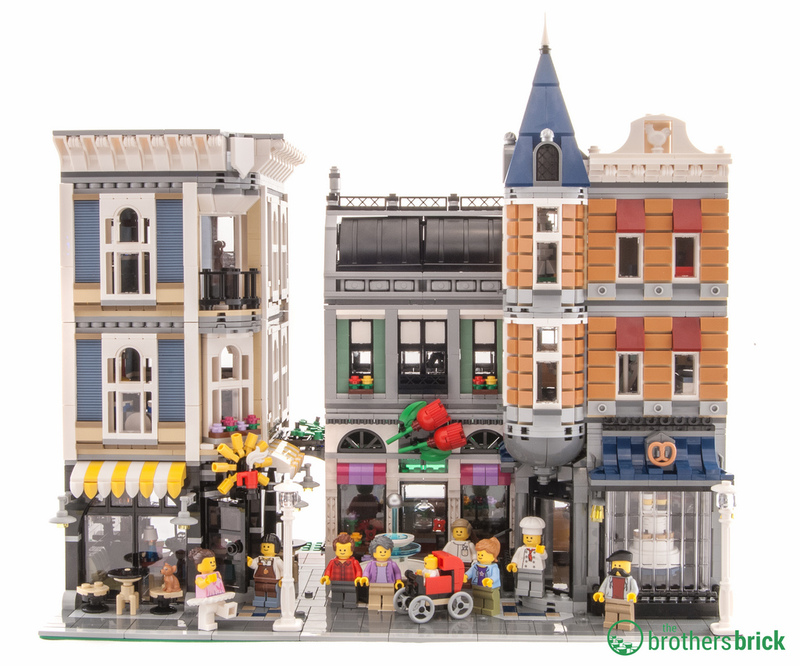 There’s a super tiny micro version of 10182 Cafe Corner, 10190 Market Street, and 10185 Green Grocer up on the shelf. She even has a MISB Cafe Corner stored against the wall! This studio loft features a tiny bathroom, a tiny kitchen with microwave, and a pull-out couch that actually functions. The couch pulls out and lays flat nicely, though getting it back into couch position is a tad difficult due to cramped quarters too small for most human hands — and I say this as a person with fairly small hands. By the window there’s a pretty large train layout with landscaping, and a teensy-tiny 10233 Horizon Express going round the layout. On the shelf is a micro version of the 10242 Mini Cooper and the 10220 VW Camper Van, and in the window you’ll find the cutest little 10181 Eiffel Tower. No loft apartment is complete without a roof-top patio. In this case, you’ve got some plants, furniture, and a great grilling area. The much-vaunted use of excavator scoops for the roof actually works really well. The roof over the loft apartment is pretty simplistic, using more 1×1 bricks with scrolls and a white chicken. Between the 1×1 bricks with scrolls are two stacked jumper plates topped off with a 1×2 plate, giving a nice half-stud overlap on each row. 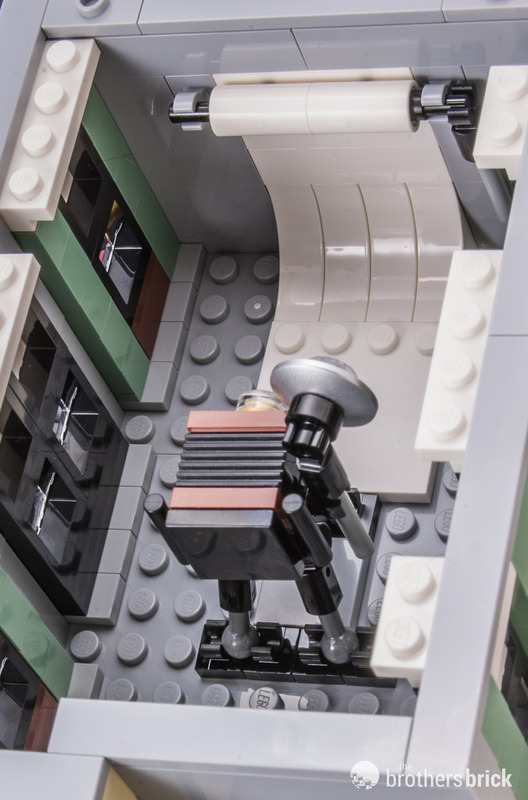 One thing that will be a bit of an annoyance to the LEGO men and women who live and work in Assembly Square is the access to all the floors, since all of the upper floors require access through another room. To get to the dentist’s office, you go through the bakery. You go in one door and out the other at the dentist’s office to go upstairs to the loft apartment. Access to the music shop comes from an external door at the back of the coffee shop; but you can’t get to the dance studio without passing through the music shop (that’s one way to drum up business, eh?). For a build with lots of details and some repetition, Assembly Square manages to avoid feeling repetitive at all (even when stacking the same bricks and putting tiles on for that sweet sweet exterior of the dentists office) unlike 10253 Big Ben. Like all Modulars, there are no stickers, only printing. Isn’t it wonderful? 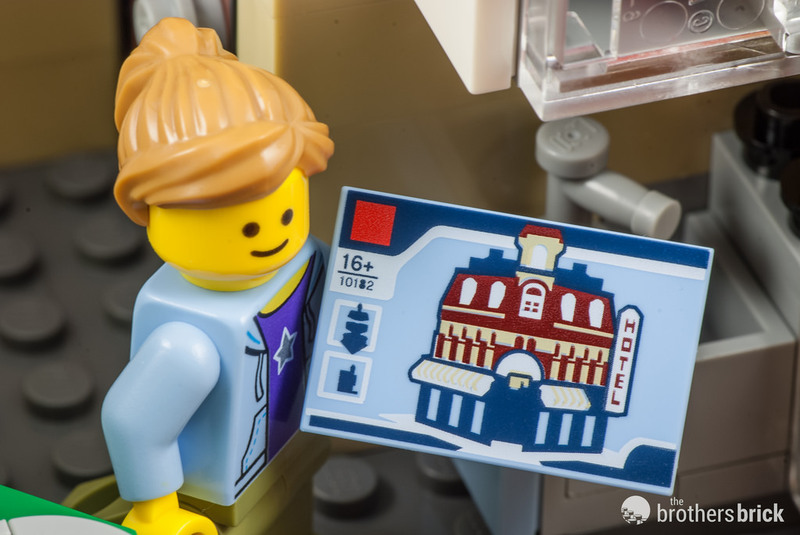 The amazing prints include a gorgeous 2×3 light blue tile as 10182 Cafe Corner. 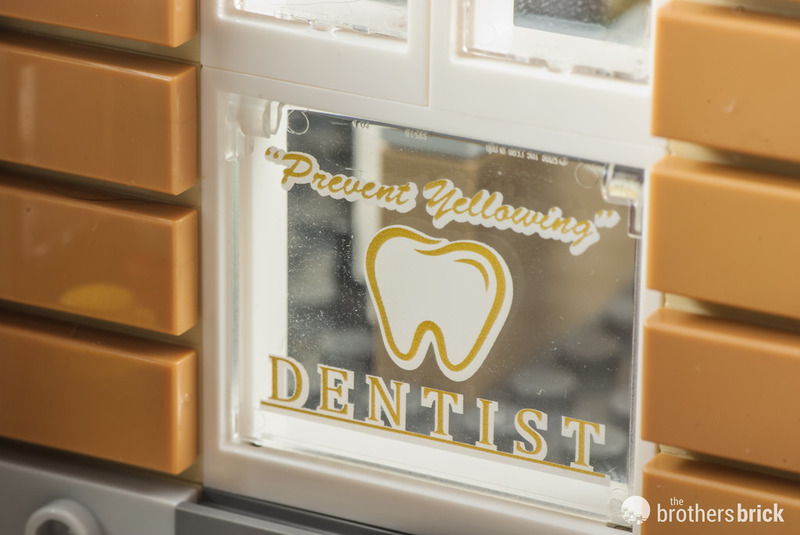 The dentist’s window is printed, as are all of the 1×1 round tiles with donuts and pastries. There are 1×1 quarter-circle tiles printed as pie, too. There’s the banker’s portrait, the suspension bridge, and a newspaper printed on 2×2 tiles. And while we’re on the topic of printing, there’s an unprinted white chicken. Assembly Square brings us enough new pieces to keep parts monkeys occupied for quite some time. There are both new colors for existing elements as well as a number of brand new elements. 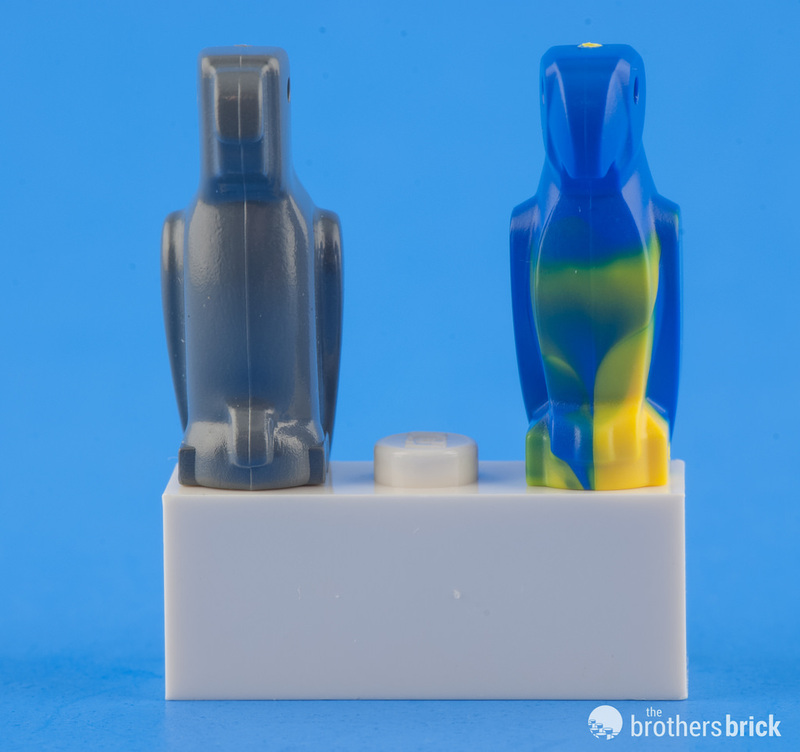 Parrot: the parrot is a new mold and a bit different from the classic pirate’s companion. 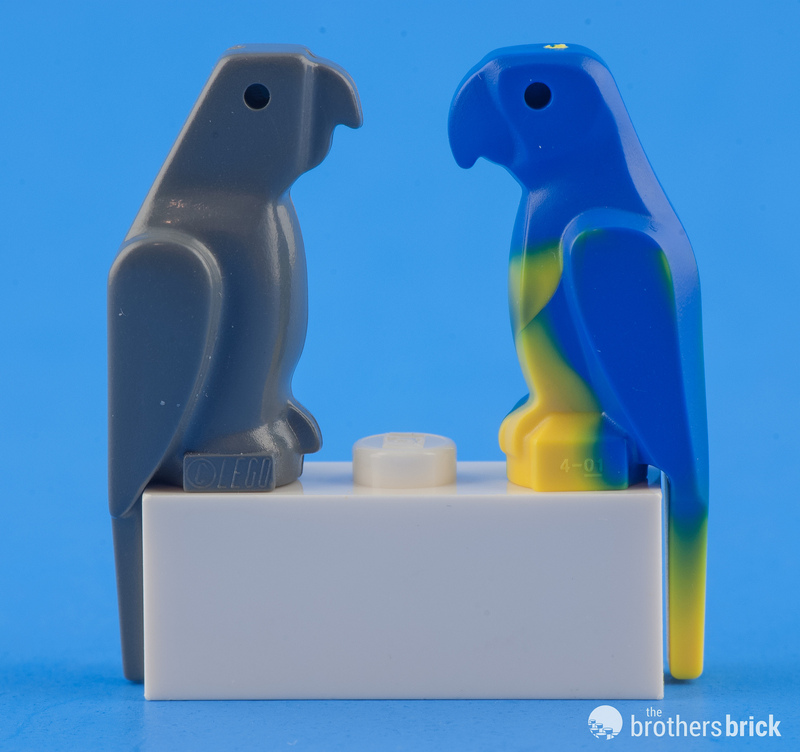 Here’s a comparison of the new parrot (blue and yellow dual-injection) and a classic parrot. 1×2 Slope with tile: The angle and textured surface precisely matches that of a 1×2 45 degree slope. You’ll get 2 dark grey, and 2 white. Like all Modulars, the minifigs in this set have the classic yellow smiley face. There are eight minifigs in this set, plus a baby, which comes with a plain white body. 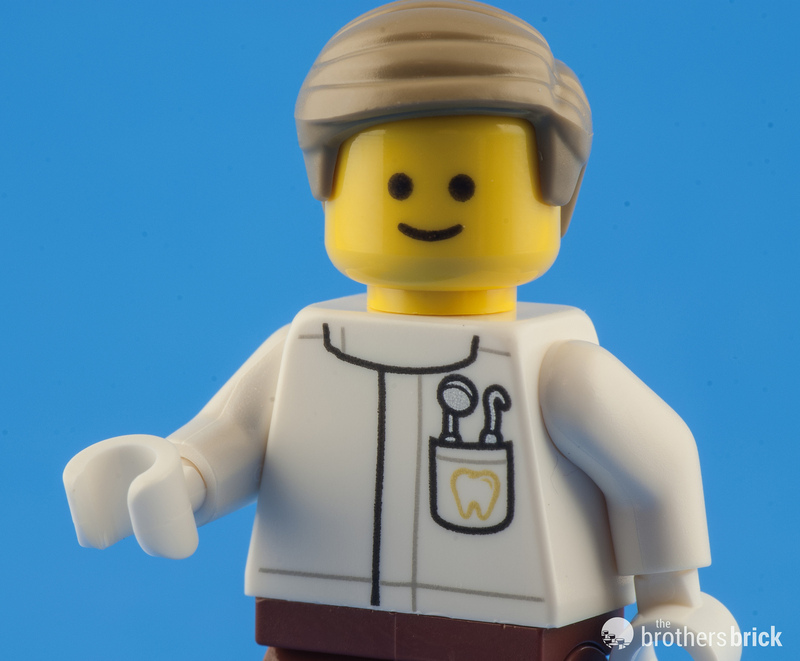 The dentist features a new torso. 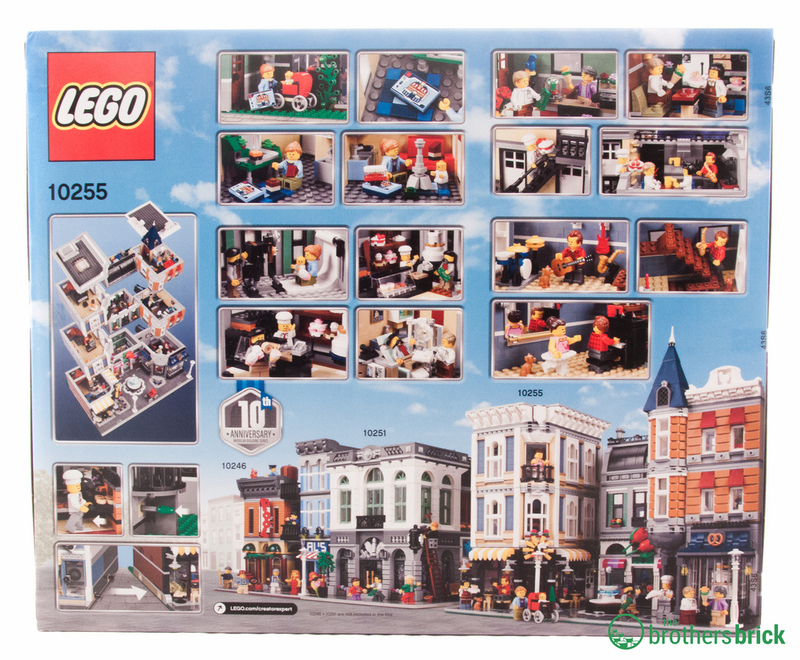 10255 Assembly Square is not likely to go on sale often, but it’s well worth it at full price. 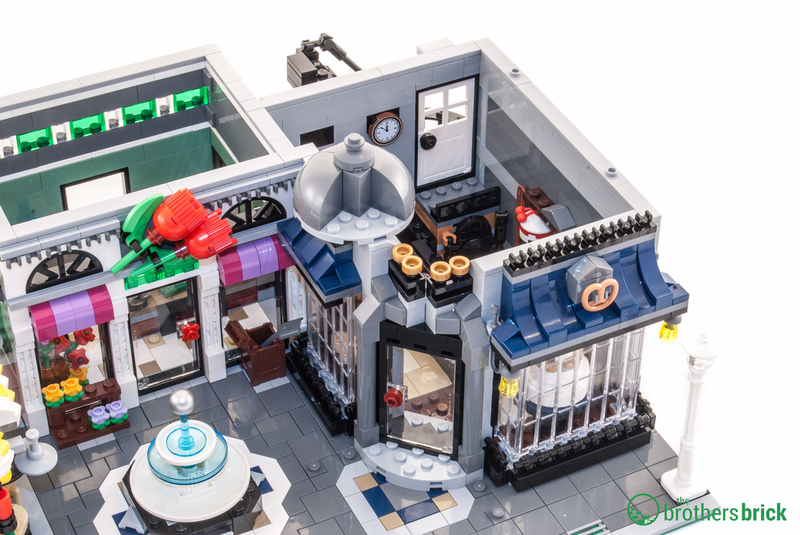 This set is a love letter to the fan community, and is packed with details we love, new parts to drool over, Easter eggs galore, and is beautiful just to look at. 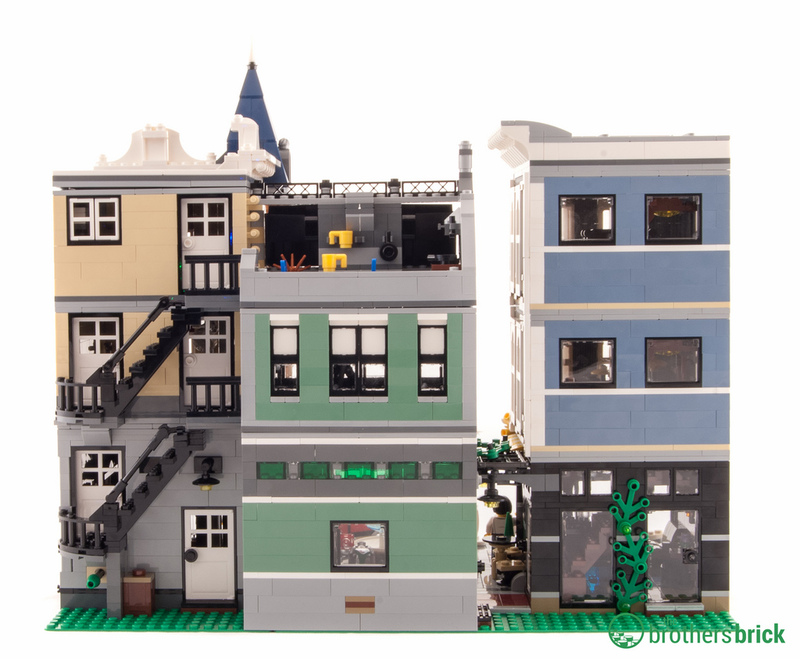 10255 Assembly Square will be available January 1, 2017.